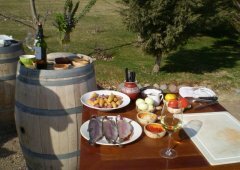 Your host will pick you up from the hotel in the morning, and we will go to a winery to meet with the chef. This program has been prepared for those people who want to explore and learn the secrets of Argentine Cuisine. The chef, who will be exclusively with us, is going to tell us also about the traditions and customs of this culinary art, right as we taste wines of the winery. Besides, in order to complement the food, the chef is also teaching how to pair wine and food. It is very important to know that in this exclusive class, you do not only watch but you also have the chance to participate in the cooking process. It is our most sincere wish that every single guest can return to their country and offer their friends a typical Mendocino dish paired with a great Argentine wine. "Aventura & Wine wine tour was excellent with attention to details and my personal preferences. It truly was one of the best trip I have ever made even considering I was by my own, I mean without friends or relatives. I had a very nice car, which yielded a comfortable ride thought several wineries I had chosen beforehand. I talked with Ana, the wine guide who showed me through the wineries, most of the way to the winery and all time during three days I spent in her company. She was really great; I learned so much, not only about the wine region and grapes, but also about the people of Mendoza, the culture, the habits, and so forth. We were served a wonderful food, from local ingredients with harmonized wine. I had a great time on the wine tour exceeding my best expectations... really a "dream-like" one. I just wanted to thank Ana again for putting together such a fantastic wine tour. Hopefully I will be back sometime in the future with others amantes del vino."